Inflation is the increase in the cost of goods and services according to the U.S.Bureau of Labor Statistics (BLS). Inflation usually occurs every year and amounts to approximately 2-3 percent. This means a $100 can only buy $97-$98 of goods after one year's time at that rate. In light of that, investments should at a minimum cover the cost of inflation if only to preserve the value of money. TreasuryInflation Protected Securities (TIPS) are a government financialsecurity that periodically adjust for an inflation adjusted return. Time is another important factor in investing. Time really is valuable, and when diligent savings is added with the discipline to only increase the amount, financial results can be pleasing. Everyone retires or dies, and money is needed in retirement. To see time in action try a savings calculator like the one at the FinancialRegulatory Authority (FINRA) and play around with the numbers. To illustrate, $1,000.00 at 5% compounded annually yields $7,078.04 inflation adjusted over 10 years with monthly deposits of $50.00 and $19,590.82 in 30 years. Interest is also very valuable and can turn small amounts into big amounts over time. When investing small amounts with a disrupted schedule look for the highest fixed interest rate available. For example, assuming a beginning savings of $8,000.00, low income, and monthly investments of just $50 a month at just 2% one can accumulate $39,205.94 over 30 years with annual compounding i.e. interest added yearly. At 5% the amount rises to $77,354.89 and at 7% the value is $125,930.53. An international bond fund with fixed returns and low management fees is one place to look. An example of a bond fund is the Total Return Bond Fund (TGLMX) listed by US News Money. Bond funds are also low-risk if they are high quality bonds. For those individuals with a higher risk tolerance, yields can be higher, but losses can also occur wiping out previous year's gains. Be careful to properly consider risk level in terms of time as risk can sometimes even out over time while providing a higher return. 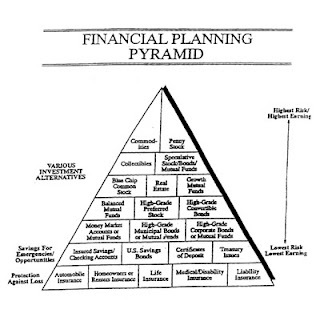 The investment risk pyramid below describes the types of risk and possible returns. Also, be sure to consider schemes and scams described by the Securitiesand Exchange Commission (SEC). In a volatile working environment and unsteady economic conditions it is a good idea to assume no consistent investment contributions, nor a steady return on investment. Using this method, one's investment plan is not caught off guard when a disruption such as unforeseen expenses, or changes in cashflow do occur. Keep in mind starting off with a high savings balance is a good way to leverage and begin earning more by saving. For example, 2% on $1000 is $20 but 2% on $100 is $2. A key is to be consistent and keep the amount manageable, a low risk investment won't be exciting to watch but sticking with it can make all the difference. Financial instruments can make or break an investment. High risk investments such as leveraged stock options can destroy savings and kill years of investment savings; be careful. In reality, investors might not have enough to diverse risk across multiple investments. In such case safer long-term, medium-volatility utility stocks with high income dividends might be an option. The MotleyFool provides some examples of dividend paying utility stocks with yields above 6%. Be forewarned though, even utility stocks can move with the market. The Empire District Electric Company Stock (EDE) listed by the Motley Fool declined over 50% from its 2007 high and still hasn't returned to that price.